The organizers of Future Music Festival Asia (FMFA), The Livescape Group and Future Music Australia today announced its biggest line-up yet for next year’s massive festival. The festival will take over the 140,000 square-meter Changi Exhibition Centre in Singapore from 13 – 14 March 2015 with an estimated 50,000 fans expected to converge over the two-days. 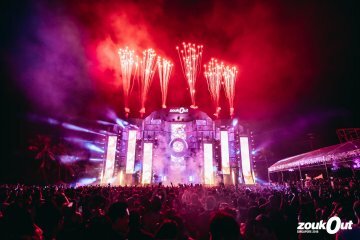 Slated to be Southeast Asia’s largest music festival ever, the organisers take cue from the success Future Music Festival Asia has obtained over the past three years and promises more punch and a cosmic show that will seal FMFA’s position as the region’s premier music festival. Over 50,000 revellers are expected to attend the festival over two days next year of which, organisers are expecting an influx of over 10,000 music tourists to specifically make their way into Singapore for FMFA. According to the organisers, the festival has plans to stay in Singapore for the long term and has set itself a target to become Asia’s largest music festival within the next three years while targeting a 20 per cent year-on-year growth in its number of foreign attendees. In the past three years where FMFA has been held in Kuala Lumpur, Malaysia, the festival has played a significant role in driving music tourists into the country by attracting over 30,000 foreign fans from across 85 countries and generating over RM120 million (SGD46 million) in tourist dollars. Singaporeans, Indonesians, Thais, Australians and Europeans formed a majority of the festival’s tourists with the brand also having a significant following in the other parts of the world. Brett Robinson, the Director of Future Music Australia said, “I believe we have got a phenomenal line-up and I don’t think Southeast Asia, let alone Singapore has ever witnessed a gathering of musical talents in a single event of this proportion and scale. So to the fans, I urge you to please get your tickets early. We’re expecting a sold-out show and we really don’t want to have to disappoint you because I promise you, next year, Future Music Festival Asia 2015 will be the biggest music event to happen in this part of the region”. “It has been our vision to bring to music punters in this region a massive music experience that resonates long after the festival is over. This is our first steps in making that vision a reality by presenting our biggest line-up to date. From the US to Indonesia to Singapore, music lovers are crossing out their calendars for the coming festival and we can only get better from here on. This will be the largest music festival in Southeast Asia and we guarantee it will be a mind-blowing two-day event”, Brett added. In terms of the entertainment value of the festival, the organisers are promising an event to remember. “If you look at our last three years, we have always spared no expense in ensuring top notch entertainment value for the fans. We understand how important it is to ensure that they get more than what they pay for. After all, FMFA wouldn’t be where it is today without our amazing fans. So we know we have got an expectation to live up to”, Iqbal Ameer, Group Chief Executive Officer of The Livescape Group says. “For 2015, FMFA is quite simply going to be our biggest yet with multiple mega stages, world-class sound, lights and stage production and huge star power. Today’s announcement is just the tip of the iceberg, and fans can expect even more big Pop, Hip Hop and EDM names when we announce our full line-up in January. So in true Livescape fashion, expect some pleasant surprises. We’re expecting to unveil a total of over 50 international and regional acts on our bill. In addition, with Changi Exhibition Centre as our new home, we are confident that we will be able to curate the biggest music playground this region has ever seen”, Iqbal added. The Changi Exhibition Centre (CEC) sits on a sprawling 30-hectare site along Singapore’s eastern coastline complete with sea views. With a combined indoor and outdoor area equivalent to 14 soccer fields, CEC is a well-equipped venue ideal for a music festival the size of Future Music Festival Asia. “We are delighted that the Changi Exhibition Centre has been chosen to host Southeast Asia’s largest music festival, Future Music Festival Asia. It is the ideal location for what will be the biggest gathering of music superstars and music fans from Singapore, across Southeast Asia and beyond. With its expansive space and breath-taking seafront location, festival-goers are in for a truly enjoyable and unforgettable experience as we are sure that The Livescape Group and Future Music Australia will be transforming CEC into an impressive magical music playground,” said Mr Leck Chet Lam, Managing Director of Experia Events, which owns and manages the Changi Exhibition Centre, Singapore. Unlike other festivals in the region, FMFA also maintains its position as a cross-genre music festival with its past editions having featured not just Electronic Dance Music (EDM) acts but also some of the biggest names in Pop, Hip Hop, Indie and Rock. The organisers are expecting to announce its full line-up in January 2015. Future Music Festival Asia, which thrilled crowds of over 55,000 in March this year, has been dubbed as the largest music festival to ever hit Southeast Asian shores. It is an internationally acclaimed and award winning festival that originates from Australia. 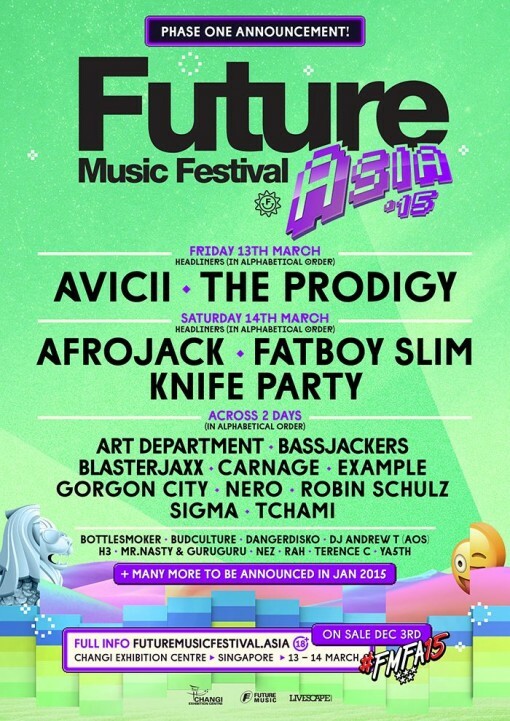 Future Music Festival Asia in Singapore will take place from 13 – 14 March 2015 at the Changi Exhibition Centre and is organised by The Livescape Group and Future Music Australia. Tickets to FMFA 2015 are available for purchase from 5.00PM, 3 December 2014 onwards via www.futuremusicfestival.asia and are available in three categories: Single Day (SGD148), Weekend – Two-Day Pass (SGD208), and VIP (SGD388). Tickets are also available for walk-in purchase at all SISTIC outlets in Singapore. Future Music Festival Asia 2015 is opened to guests aged 18-years and older only. ID verifications will be carried out at the door. *Ticket prices listed above also exclude the ticket agent’s booking and credit card processing fees. Festival rules apply. FMFA implements a strict no re-entry policy for security reasons. The organizers also reserve the right to deny entry or to eject any guest deemed to be in violation of festival rules.